Liteon 128GB M.2 2280 SSD Solid State Drive -. - Cellular 4G (Sim Slot Located Under Battery) -. - Front & Rear HD 720p Webcams with Flash & Privacy Shutter -. - 1x Headphone / Microphone Combo Jack | Kensington Security Lock Locator -. Label Pro x2 612 G1 i3-4012Y/4GB/128GB-SSD/12.5"HD/W10P WLAN/BT/CAM/With power keyboard. Main Storage 128 GB SSD - (M.2) SATA 6Gb/s. Network Interface Gigabit Ethernet. Speed 1600 MHz. Output 45 Watt, 19.5 V.
IPad 4th Gen- 128GB- Wi-Fi Cellular. Colour Black. Apple iPad 4th generation-. An excellent working order and fully functional iPad. Instruction manuals and original box. Pair it with an optional Lenovo Active Pen for convenient input, and rest assured in its durability and multiple levels of data and password security. If you change your mind. Upon receipt of your order you will be asked to sign for the goods received in good condition. Storage: 128GB SSD. Battery : 5,200mAh (39.5Wh, 7.6V). OS : Windows 10 Pro. Fully working. BIOS Checked. Tests and Condition. With both pen and finger support, this slim device provides perfect flexibility to accomplish your daily tasks. Processor : AMD® Z-60 APU (1.0 GHz). User Interfaces : Touch-screen Ports Two USB 2.0 ports, one DC in connector, one HDMI connector, one stereo headphone/line-out jack, one docking port Card Slots One SD/SDHC/SDXC card slot, Integrated SmartCard slot Security Fingerprint sensor, embedded Trusted Platform Module (TPM), Integrated SmartCard slot (requires third-part application). MPN - A1674. Model - IPAD PRO 9.7". Included in the sale – IPAD & USB Charging lead. Colour - Black/ Space Gray. Wifi Cellular - Yes. For example, card, pins, tissue paper, plastic bag etc. THIS MAY ALSO INCLUDE AN ITEM THAT HAS NOT ARRIVED WITH YOU. With a magnetic hinge, it is easy to snap in or out of the smart keyboard. Micro SD Card Slot (upto 64GB) (Not included). Tablet on its Own. Form Factor Convertible Tablet-PC. Battery Life. Average Battery Life (in hours) 8 hours. Apple iPad Air 128GB WiFi. - General iPad Case. All iPad's are fully tested and in perfect working order. - FREE CASE. Overall I'd say Grade A-B (Good Condition). The last photo is just to show how the stand works. B - The product has traces of use, there may be scratches on both the display and the housing, minor abrasions, slight deformation / bending of the plastic (e.g. at the micro-usb input). Connectivity WiFi 802.11 b/g/n. OnePlus 6T Smartphone Android 6.41” 8GB 128GB - Midnight Black. - Sim Ejector Tool. - Plastic Case. The screen of this item is in good condition, but may have 1-2 fine scratches / marks from previous use / wear. Its smaller form factor makes it easier to hold in one hand.The iPad mini is more thiner and sleek design. Apple iPad mini 3 128GB Wi-Fi 4G(Unlocked) Space Grey- UK Model. iPad mini 3 128GB Wi-Fi 4G (Cellular)- Unlocked to any sim. Sim Ejector Tool. - Plastic Case. Perfect pictures. The rear of the item is in excellent condition showing no visible marks / scratches or signs of use / wear. The world’s thinnest and lightest fully-rugged 10.1" Windows® 8 Pro tablet. Genuine Panasonic Toughpad FZ-G1 128GB 4G Black,Silver tablet. 4G large RAM to keep system running properly. 4GB RAM 64GB ROM. 1920x 1200 resolution brings you high contrast and more vivid visual experience. Windows 10 System. Detail Image. I5 4300U CPU. Microsoft Surface Pro 2. Surface Pro Type Cover Keyboard. Original Surface Pro 2 Pen. Windows 10 Pro. The Lenovo Tab 4 10 is the first tablet to hide many tablets in one. Brilliant HD display - Enjoy a solid visual experience with the 10.1" HD display, which gives your photos and movies a vibrant feel that you'll want to share with the entire family. 16, 32, 64 & 128GB / Ship from UK w/ 2 Days Handling! Included in-box the island-style keyboard has a POGO and magnetic connection – simply clip it on and go. The new in-box S Pen opens up a world of possibilities. With better sensitivity and a more comfortable grip than before, it feels very natural to use. Storage: 128GB. Connectivity: WiFi. Model: Surface Pro 4. Minor wear & tear On Screen and Bezel. Screen Size: 12.3"., 1000% Happy With Item. Colour: Silver / Black. Tested: Working – May have a Fixable Fault (e.g. Cracked Screen / Missing Parts etc.). The Microsoft Surface Pro Tablet features a 12.3" screen with a screen resolution of 2736 x 1824. Connectivity options on the Surface Pro include Wi-Fi and Bluetooth, and other features include a Touch Screen. GPD Pocket 2 is also an excellent e-reader. Compared with traditional e-readers, GPD Pocket 2 possesses a larger storage capacity and supports more software and e-book formats. GPD Pocket 2. Use of In-Cell full lamination allows the Pocket 2 to have a screen that is thin, thus reducing the weight of the device. Model 1796. 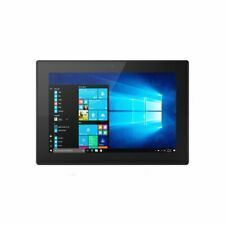 Microsoft Surface Pro 5 2017 Tablet PC. All units have been securely data-wiped; Windows 10 Pro 64-bit has been reinstalled and the units have been fully tested before being reset to factory defaults. Narrower black side of the screen, with the upper border of 5mm and the lower border of only 3mm, contributing to a higher screen occupation ratio. M.2 SSD 128GB, Replaceable, No Capacity Ceiling. Product Positioning. 128GB Solid State Hard Drive. Dell Venue 11 Pro in a very good condition. Genuine Back Protector. Integrated speakers. (4GB RAM, 128GB SSD, LTE, Windows 10 Pro). black incl. Bookcover with full keyboard and touchpad. Battery: up to 10 hours of battery life. SanDisk 128GB A1 MicroSDXC UHS-1 (100MB/s) with Adapter. Samsung Galaxy Tab A 10.5 WIFI and Cellular 2018 model in black which is unlocked and working on all networks. Updated with official 'Android 9 Pie' with Samsung's latest 'One UI'. Wacoms most natural and advanced pen performance. Wacom Pro Pen 2. Professional computing power and graphics options to run the most demanding creative 2D and 3D and CAD applications. In this case, the Supplier will inform you of any delay as soon as possible and will give you the option of cancelling your order at this point. 128gb Touch screen Microsoft Surface 3 Pro (8.1 pro) with magnetic keyboard, pen and USB 3.0 Ethernet adapter. SB 3.0 Ethernet adapter for hard internet connection (if not using wi-fi). Active Microsoft Pen (as shown in the pictures) - new ( spare) battery (AAAA). It's that kind of performance—plus impressive battery life of up to 9 hours. Go from laptop to tablet with the multi-position Kickstand and keyboard. Keyboard cover. Light scratches on the body that may be visible from more than 20 cm away. MPN - A1823. Model - IPAD 5th Gen. Included in the sale – IPAD & USB Charging lead. Colour - Black/ Space Gray. Wifi Cellular - Yes. For example, card, pins, tissue paper, plastic bag etc. THIS MAY ALSO INCLUDE AN ITEM THAT HAS NOT ARRIVED WITH YOU. Will have marks to the rear and to the sides of the unit. Screen will be in mint condition. It's that kind of performance—plus impressive battery life of up to 9 hours. Go from laptop to tablet with the multi-position Kickstand and keyboard. Surface Pro 4 Detachable keyboard cover. Light scratches on the body that may be visible from more than 20 cm away.